Our cash and carry manager, Olga Ramirez, AIFD, CFD designed several floral arrangements for our Open House/Happy Hour on October 17, 2018. 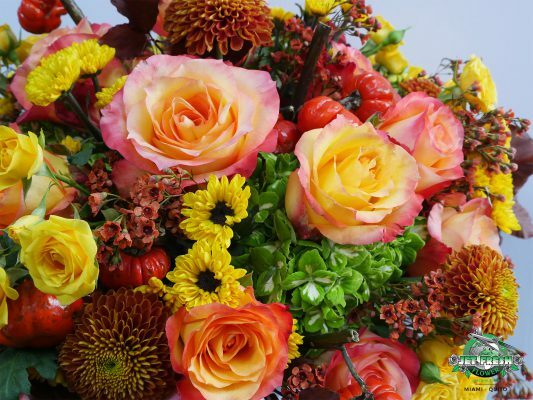 These floral arrangements feature a variety of fresh-cut flowers from Jet Fresh Flower Distributors in Miami, Fla. Each of these arrangements has its own unique characteristic that’s both fun, fresh and beautiful. 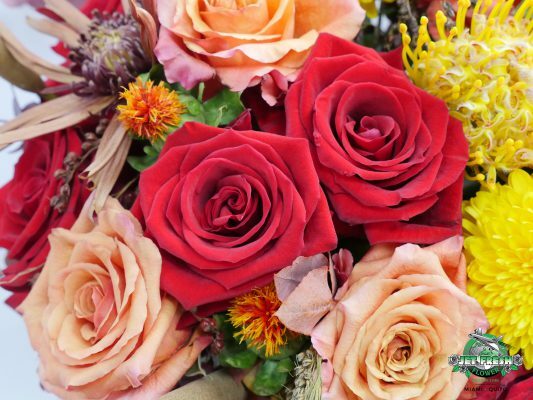 The event opened doors to members of the floral industry in Miami and to those in-town for the floral shows in South Florida. 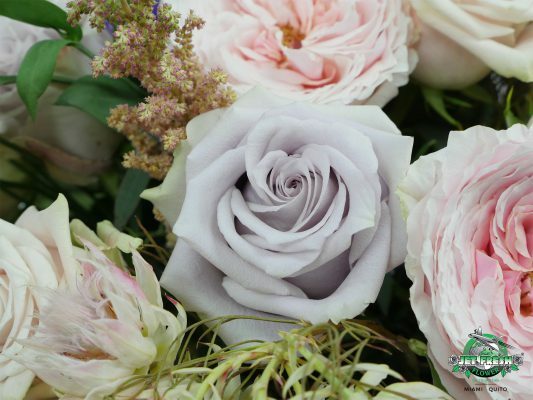 It featured a showcase of roses and garden roses from top farms and breeders, as well as other beautiful flowers flying at the Jet for #FreshInspiration. Click here for highlights. We’ve got spirit, yes we do! This is the perfect green floral arrangement to celebrate our Jet Fresh Open House/Happy Hour. It’s completely green to match our theme, and includes a wonderful assortment of textured flowers in different shades of green which stand out in this green monochromatic flower arrangement. Olga’s green centerpiece includes a mixture light and dark green coordinating flowers. “Super Green” roses from our farm Jet Fresh Flower Growers, S.A. are one of the focal flowers along with green Anastasia Spiders, which both have a similar shade of green. Green Dianthus is placed throughout the arrangement adding a darker shade of green, along with Emerald Elite Hydrangea which are variegated and also a stand-out in this centerpiece. Green Kale, Hypericum, and greenery contribute to the extra texture in this green monochromatic centerpiece, while the green color-enhanced Hookeriana Protea offer a more vibrant shade of dark green for extra dimension. 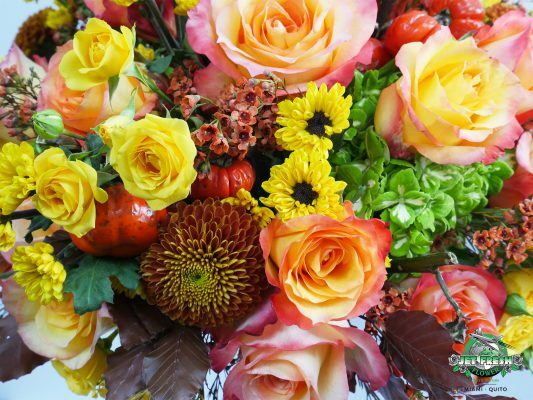 It’s easy to get into the fall spirit at Jet Fresh Flower Distributors. We have so many amazing flowers and fillers that spark your creativity to create something fresh. Olga went from the vase to the dresser with this festive fall box drawer arrangement. Olga incorporated our SAF blue ribbon rose winner, “Milva” as well as the newest red rose now growing on our farm: “Finally” from United Selections; the perfect substitute for red “Freedom.” Yellow Cremons take this arrangement to a whole other level, though, with large ball-like heads which look very similar to dahlias. 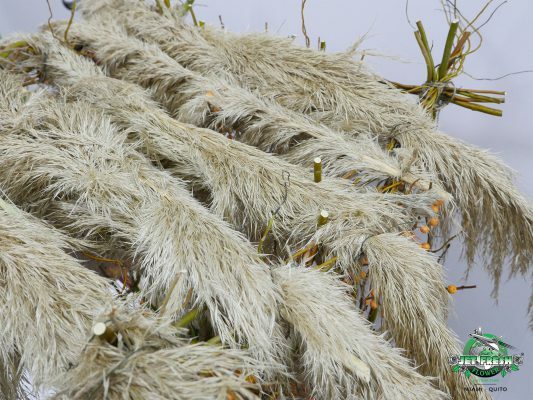 Additional fillers in this arrangement were taken from our cash and carry and available in wholesale quantities: Cocoa Anastasia Spiders, Yellow Pin Cushion Protea, Orange Carthamus, Broom Corn, Cattails and Ovata Eucalyptus. 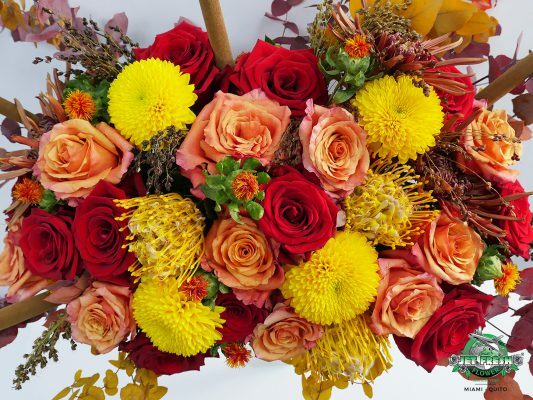 Olga designed another fall #FreshInspiration bouquet using popular flowers and fillers available at Jet Fresh Flower Distributors. 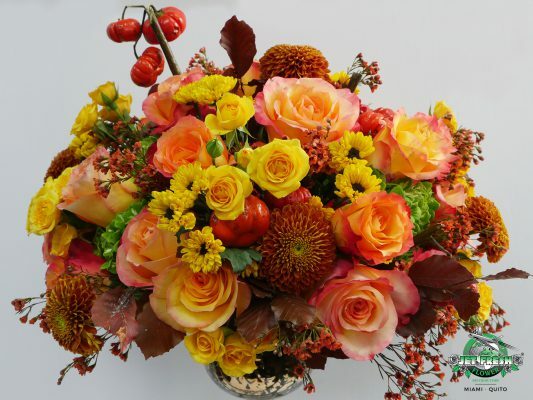 This arrangement also has a fall-inspired color palette with multiple tones of orange and yellow flowers, as well as hints of green to capture the change in season. Our SAF red ribbon winning rose, “Encanto” is a beautiful bi-color rose accompanied by bright yellow spray roses and Yellow “Ying Yang” Pom Buttons. 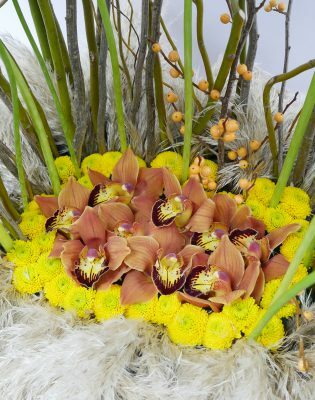 Bronze Cremons give the arrangement an elegant look with dark bronze petals and hints of yellow. Olga also included Terra-cotta Waxflower and Green Emerald Elite Hydrangea. And finished off with Tree Pumpkin and Dried Oak Leaves. This red monochromatic floral arrangement Olga designed for our open house is full of elegant flowers in different shades of red that are textured from Jet Fresh Flower Distributors. 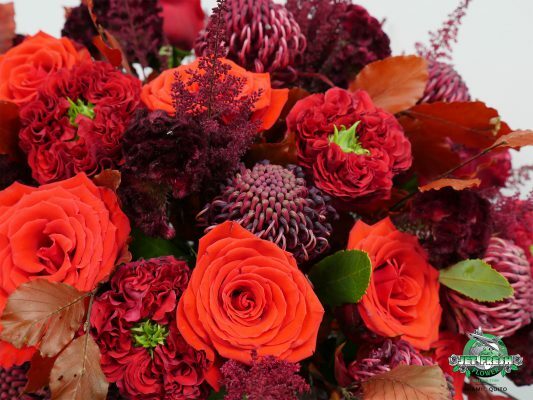 Similar to the green arrangement earlier, Olga does a great job at incorporating different shades of red to allow each flower to stand out next to the other without just blending. 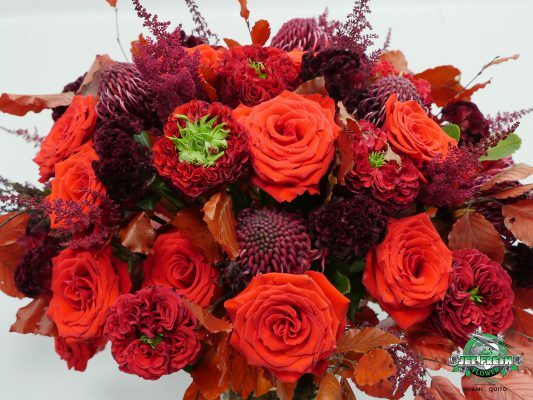 She incorporated Orange “Santana” Roses which have a reddish tone, as well as “Red Monster” Garden Roses that are perfectly ruffled with a bright green center. Olga also added Red “Waratah” Proteas and Red “Paul Gaader” Astilbe; and finished it off with Red “Bombay” Celosia and Dried Oak Leaves. Olga designed another floral bouquet for our open house using a pastel color palette that’s simply gorgeous for weddings and events. 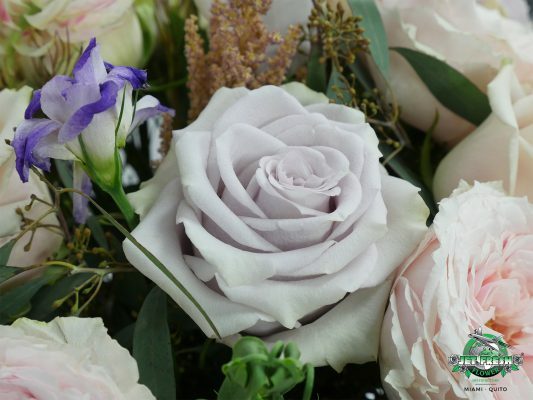 The roses in this arrangement are varieties which are coming soon to our farm, Jet Fresh Flower Growers, S.A. “Sandy” from Jan Spek Rozen and Conectiflor, S.A. is an elegant cream rose that’s a wonderful substitute for “Quicksand” roses. Accompanied by the lovely “Silvery Light” from the breeder NIRP; a gorgeous light lavender variety also coming soon from our farm. By this time, you should already know that Olga is a huge fan of “Tsumugi” Wabara Series Garden Roses from Alexandra Farms. 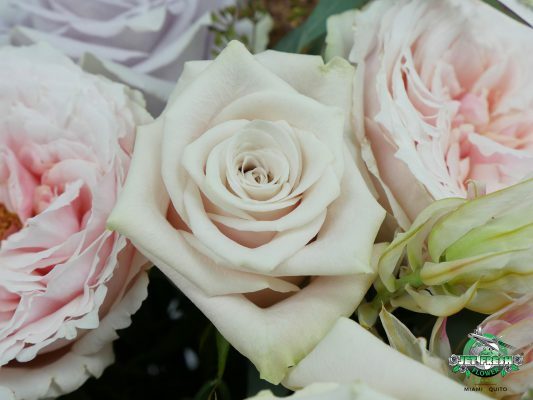 “Tsumugi” is a light pink rose with over 100 petals that continue to bloom as they’re hydrated. 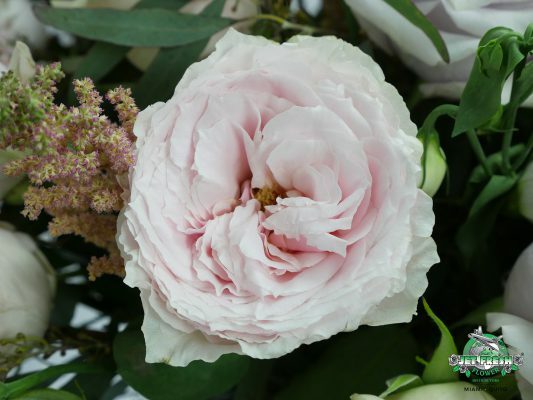 This exquisite garden rose has a cupped shape with a large head size that captures the elegance for high-end floral events. No wonder Olga loves it. 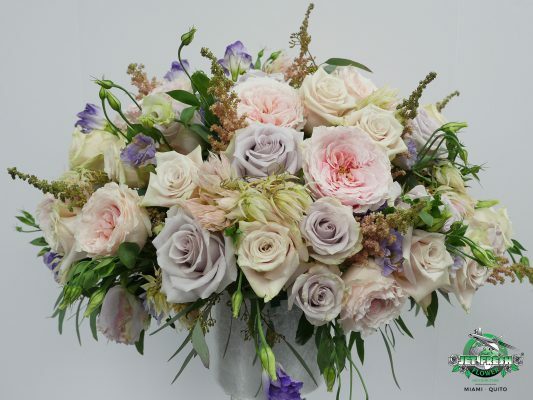 Blushing Bride Protea and Lavender Lisianthus are also filled in throughout this bouquet along with Peach “Inferno” Astilbe and Seeded Eucalyptus making this a stunning pastel floral centerpiece. 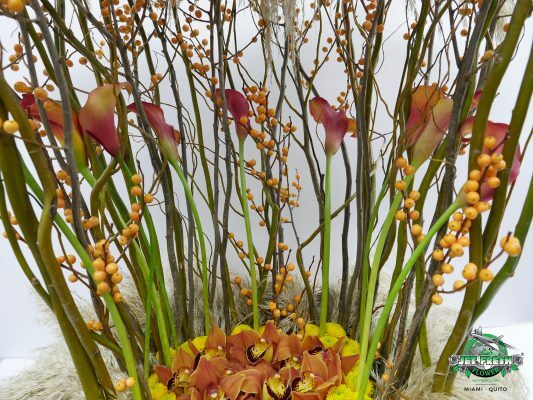 Last but not least is a very unique arrangement designed by Olga Ramirez, AIFD, CFD. This design is Olga’s original concept as she was inspired by the meaning of Thanksgiving; appreciating the things which we should be grateful for: a roof over our heads, fresh food to eat and the love of friends and family surrounding us. 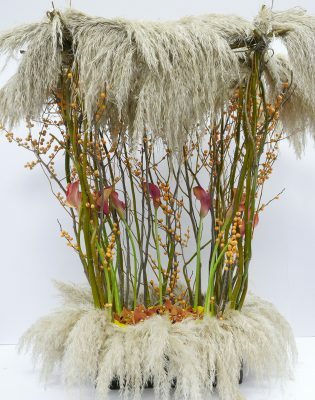 She created a hut-like structure using Pampas Grass for the upper and lower portion of the design, giving shelter to other fresh-cut flowers: Brown Cymbidium Orchids and yellow pom buttons. The structure is then surrounded by Curly Willow branches, Orange Ilex and mini calla lilies. Are you feeling inspired by any of these floral centerpieces? These flowers and more are available to order from Jet Fresh Flower Distributors and farm-direct with Jet Fresh Global Trading. Please contact us at Sales@JetFreshFlowers.com for information. This entry was posted in #FreshInspiration, News and tagged aifd, arrangements, cfd, fresh inspiration, inspiration, olga, Olga Ramirez, open house.